Maria Anna of Neuburg (Spanish: Mariana; 28 October 1667 – 16 July 1740), was Queen of Spain from 1689 to 1700 as the second wife of Charles II, the last Habsburg King of Spain. Born in Benrath Palace in Düsseldorf, Maria Anna was the twelfth child of Philip William, then Duke of Berg and Jülich and Elisabeth Amalie of Hesse-Darmstadt. 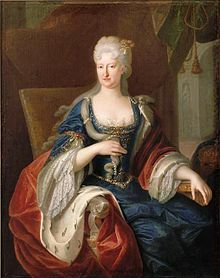 Her childhood was spent in Neuburg; her eldest sister Eleonore became the third wife of Emperor Leopold, making Maria Anna aunt to emperors Joseph I and Charles VI. When Philip William succeeded Charles of Simmern as Count of the Palatinate in May 1685, Louis XIV claimed half of it. The French invaded in September 1688 and before withdrawing in 1689 destroyed much of Heidelberg, plus another 20 substantial towns and numerous villages. This policy was applied to a large section of the Rhineland but especially the Palatinate, which was raided again in 1693 and the devastation shocked much of Europe. This confirmed Maria Anna's pro-Austrian, anti-French sentiments, important factors in her selection as the second wife for Charles II of Spain. Charles's first wife Marie Louise of Orléans died on 12 February 1689 without producing an heir and his declining health made remarriage a matter of urgency. His mother and Queen Regent, Mariana of Austria, selected Maria Anna based on her family's history of fertility and their opposition to France. She and Charles were married by proxy in August 1689; their formal wedding took place on 14 May 1690 in San Diego, near Valladolid. Charles' death was anticipated almost from his birth in 1661; the unfortunate victim of Habsburg inbreeding, he was "short, lame, epileptic, senile and completely bald before 35, always on the verge of death but repeatedly baffling Christendom by continuing to live." His parents Philip IV of Spain and Mariana of Austria were uncle and niece, making Charles their son, first-cousin and great-nephew respectively. The impact of this inbreeding is not fully understood and his elder sister Margaret Theresa does not appear to have suffered the same issues. Despite Charles' physical ailments, foreign observers like the Marquess of Torcy noted his mental capacities remained intact. For much of his reign, power was exercised through Regents, primarily his mother Mariana; while Charles suffered from frequent ill-health, part of this appeared to be deliberate policy by both his mother and later Maria Anna to restrict access to him. While the Spanish Empire or 'Monarchy' was no longer the pre-eminent global power, it was still an enormous global confederation that remained largely intact. This made its inheritance a matter of huge importance; if Charles died childless, his closest successors were members of the French Bourbons or Austrian branch of the Habsburgs. Acquisition of an undivided Spanish Monarchy by either would alter the European balance of power. Maria Anna of Neuburg by Luca Giordano, Prado Museum, Madrid. Charles' second marriage was also childless; by now he was almost certainly impotent, his autopsy later revealing he had only one atrophied testicle. Much of Maria Anna's power derived from her position as mother of the future monarch which dissipated when it became clear this was unlikely to occur. The Spanish political establishment was split into pro-Austrian and pro-French factions, the latter led by Fernández de Portocarrero, Cardinal and Archbishop of Toledo. For much of this period, government was controlled by the 'Austrians,' headed by Marianna of Austria, with Maria Anna taking over after her death in 1696. Under their influence, in 1690 Spain joined the anti-French Grand Alliance which proved a disastrous decision; the state declared bankruptcy in 1692 while by 1696, France occupied most of Catalonia. Despite this, Maria Anna and the Austrians held onto power,[a] although Charles was later forced to banish many of her German entourage. In 1698, Charles fell seriously ill and his death seemed imminent. On 11 October, Britain, France and the Dutch Republic signed the Treaty of the Hague or First Partition Treaty, an attempt to impose a solution to the Succession issue on Spain and Austria. The terms made six year old Joseph Ferdinand of Bavaria heir to the bulk of the Spanish Empire, the rest split between France and Austria. Joseph Ferdinand was the only son of Charles' niece Maria Antonia 1669-1692 and her husband Maximilian II Emanuel of Bavaria. This was an acceptable compromise for Maria Anna who was related by marriage to Leopold but like Max Emmanuel also a Wittelsbach. The Spanish opposed the partition of their Empire; on 14 November 1698, Charles published his Will, naming Joseph Ferdinand heir to an undivided Spanish Monarchy. Maria Anna was appointed regent during Joseph Ferdinand's minority, an announcement allegedly received by his Spanish councillors in silence. When Joseph Ferdinand died of smallpox in 1699, France, Britain and the Dutch Republic agreed to the Treaty of London or Second Partition Treaty in March 1700. This replaced Joseph Ferdinand with Archduke Charles, with Spanish possessions in Italy, the Netherlands and Northern Spain divided between France, Savoy and Austria. Charles modified his Will in favour of Archduke Charles, once again specifying an undivided Monarchy but this time adding the requirement Spain remain independent of Austria. However, Louis continued supporting the pro-French faction with money; and it was clear the Spanish would not agree to territorial concessions voluntarily, while many, including Charles, disliked the Austrians and preferred a Bourbon candidate. Maria Anna continued her attempts to ensure an Austrian successor; in June 1700, Charles's personal confessor Froilán Díaz, who was considered pro-French, was arrested by her ally Balthasar de Mendoza, Bishop of Segovia and Inquisitor General. Díaz was charged with 'bewitching' Charles, but acquitted; when Mendoza refused to accept this, a Council was established to investigate the Inquisition itself and while it survived as an institution until 1834, its power was broken. In September 1700, Charles became ill again; by 28 September he was no longer able to eat and Portocarrero persuaded him to alter his Will in favour of Louis XIV's grandson, Philip of Anjou. When Charles died in November 1700, Philip was proclaimed King of Spain on 16 November 1700, with Portocarrero as his chief advisor, and Maria Anna was exiled to Toledo. Maria Anna lived quietly in Toledo until 1706, when the forces of her nephew Archduke Charles briefly occupied the city. Her enthusiastic reception resulted in her expulsion from Spain a few years later and she settled in Bayonne, France, where she lived for the next few decades, largely forgotten, allegedly marrying a local barrel-maker. In 1739, being old and sick, she was allowed to return to Spain and given lodging in the Infantado Palace in Guadalajara, where she died on 16 July 1740. She was buried in El Escorial Monastery. Her marriage to Charles in 1690 is commemorated in the Festival book listing the elaborate celebrations held in the city of Naples to mark the occasion (L’ossequio tributario della fedelissima Città di Napoli, per le dimostranze giulive nei Regii Sponsali del Cattolico, ed Invittissimo Monarca Carlo Secondo colla Serenissima Principessa Maria Anna di Neoburgo Palatina del Reno). She appears in Victor Hugo's play Ruy Blas as the Queen who falls in love with a commoner, possibly inspired by her real life remarriage. ^ Helped by spurious rumours of Maria Anna's pregnancy. ^ Lynn, John (1999). The Wars of Louis XIV, 1667-1714 (Modern Wars In Perspective). Longman. p. 198. ISBN 978-0582056299. ^ Dosquet, Emilie (2016). The Desolation of the Palatinate as a European News Event in News Networks in Early Modern Europe. News Networks in Early Modern Europe. Brill. pp. 643–644. doi:10.1163/j.ctt1w8h1ng.35 (inactive 2019-03-09). ISBN 978-9004277175. JSTOR 10.1163/j.ctt1w8h1ng.35. Retrieved 26 September 2018. ^ Rommelse, Gijs (2011). Ideology and Foreign Policy in Early Modern Europe (1650–1750). Routledge. p. 224. ISBN 978-1409419136. ^ Durant, Ariel, Durant, Will (1963). Age of Louis XIV (Story of Civilization). TBS Publishing. ISBN 978-0207942273. ^ Callaway, Ewen. "Inbred Royals show traces of natural selection". Nature.com. Nature; International Weekly Journal of Science. Retrieved 9 April 2018. ^ Storrs, Christopher (2006). The Resilience of the Spanish Monarchy 1665-1700. OUP Oxford. pp. 6–7. ISBN 978-0199246373. ^ Storrs, Christopher (2006). The Resilience of the Spanish Monarchy 1665-1700. OUP Oxford. p. 157. ISBN 978-0199246373. ^ Storrs, Christopher (2006). The Resilience of the Spanish Monarchy 1665-1700. OUP Oxford. p. 158. ISBN 978-0199246373. ^ Ward, William, Leathes, Stanley (1912). The Cambridge Modern History (2010 ed.). Nabu. p. 385. ISBN 978-1174382055. ^ Mckay, Derek, Scott, HM (1983). The Rise of the Great Powers 1648 - 1815 (The Modern European State System). Routledge. p. 55. ISBN 978-0582485549. ^ Hargreaves- Mawdsley, HN (1979). Eighteenth-Century Spain 1700-1788: A Political, Diplomatic and Institutional History. Macmillan. pp. 15–16. ISBN 978-0333146125. ^ Lo, Ruth. "Festival Book as Political Propaganda: The Long Celebrations for a Marriage in Naples". Brown University. Retrieved 20 April 2018. This page was last edited on 7 April 2019, at 14:25 (UTC).